For some, brushing and grooming a dog is a ritual on par with the Japanese tea ceremony; an observed, practiced kata that is an art form unto itself. For others, it is a chore to be undertaken after we’ve spent hours looking for a brush; then another hour chasing the dog. Of course, all this takes place only after our third Dyson Animal in the last year has lost its cyclonic force of nature. But no matter where you fall in the spectrum of brushing ritual, there are a few hard and fast rules that will always prevail. 1. 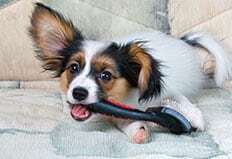 When brushing your dog outdoors, the wind will always change direction and blow directly in your face. 2. If you have more than one dog, each will require a different brush and the brush that suits their coat the best will suit their temperament the least. 3. Again, for the multi dog household, there will always be one dog who only wants to be brushed when it’s not their turn. 4. The side opposite your dog’s favorite side to lie on will always be shinier and better groomed. 5. With multiple dogs, there will always be one dog whose job it is to get the dog being brushed to chase them. 6. Every dog considers it their duty to compliment your styling efforts by rolling in as much dead grass as possible. 7. If you have set Tuesday aside as your grooming day, your dog will find a new cocklebur patch on Monday. 8. The more arthritic you get, the more often your dogs will need to be groomed. 9. Grooming emergencies always occur when you are wearing your work clothes. 10. If your vacuum cleaner is going to break, it will be right after you brushed an English Mastiff sized pile of fur onto your carpet. All joking aside, although brushing and grooming our dogs is a chore that begs procrastination, there are huge benefits to be gained besides a cleaner dog and less fur in your house. For one, it helps you develop a bond with your dog and can even be relaxing for you both. Second, and perhaps more important, it helps to alert you to changes in your dog’s coat and body that might go unnoticed without regular brushing and grooming sessions. So grab a beer, a brush, and some treats and spend some quality time brushing and bonding. Just remember to put the beer in a sippy cup if you don’t want to sound like Sylvester the cat.